I’ve been tracking the condition of Martin “Marty” Wagner fairly closely. On July 6, Wagner fell off the roof of his Arlington, VA house and has essentially been in a coma since then. Wagner’s neighbors are rooting for him. 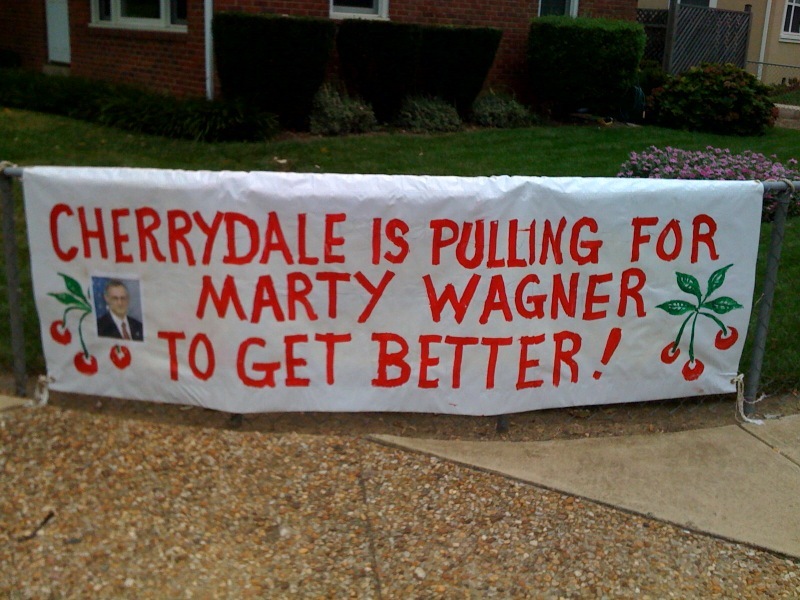 One of his neighbors was good enough to send me this photo of a sign that is in the Cherrydale neighborhood of Arlington, VA.
We’re all rooting for you, Marty! As I always do in these instances… I will have Wagner updates when there are significant developments. From regular updates from the family, there are two ways to stay updated. This site was created by Bruce McConnell for Wagner’s wife and they post updates there regularly. Thanks for your support of Martin. CarePages is a great way to keep lots of people updated and allow them to support someone facing a health challenge. Thanks for spreading the word – and spreading support for your friend.